Katty Aoun, “Papi,” litho ink on printmaking paper, 2014. Katty Aoun, “Cindy,” litho ink on printmaking paper, 2014. 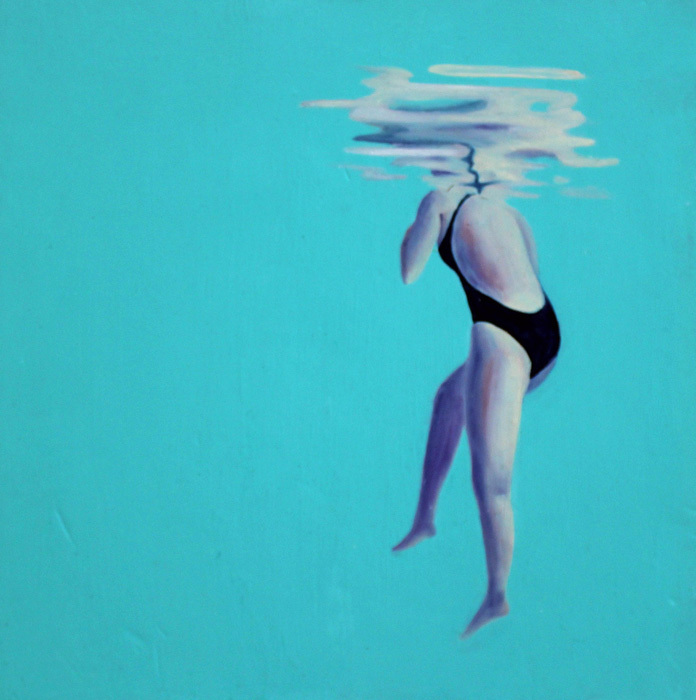 Felipe Melendrez, “Living Underwater I,” acrylic and oil on panel, 2017. 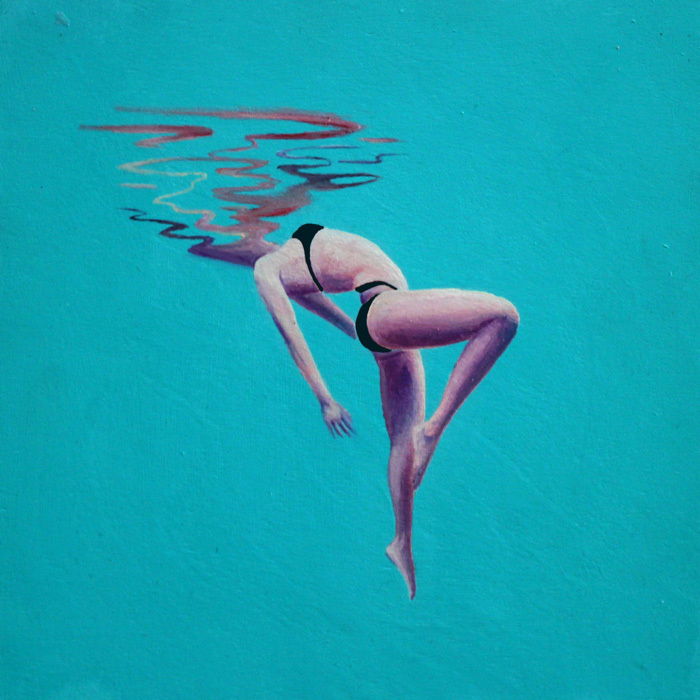 Felipe Melendrez, “Living Underwater II,” acrylic and oil on panel, 2017. 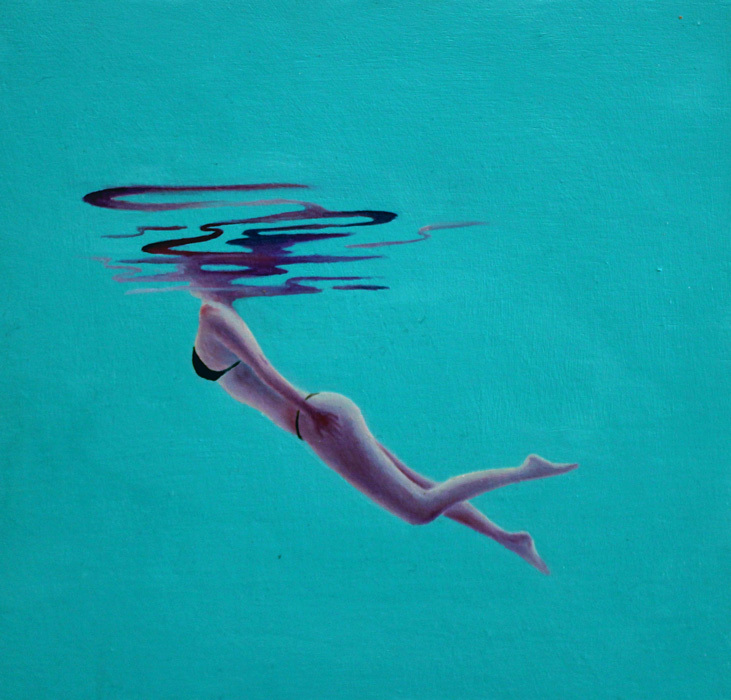 Felipe Melendrez, “Living Underwater III,” acrylic and oil on panel, 2017. 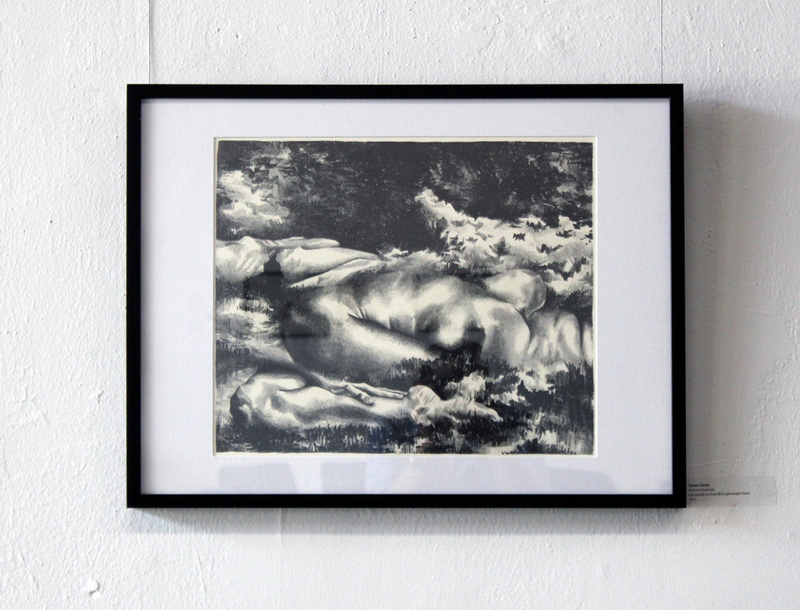 Daiana Oneto, “Hidden Exchange,” lithograph on Fabriano paper, 2015. 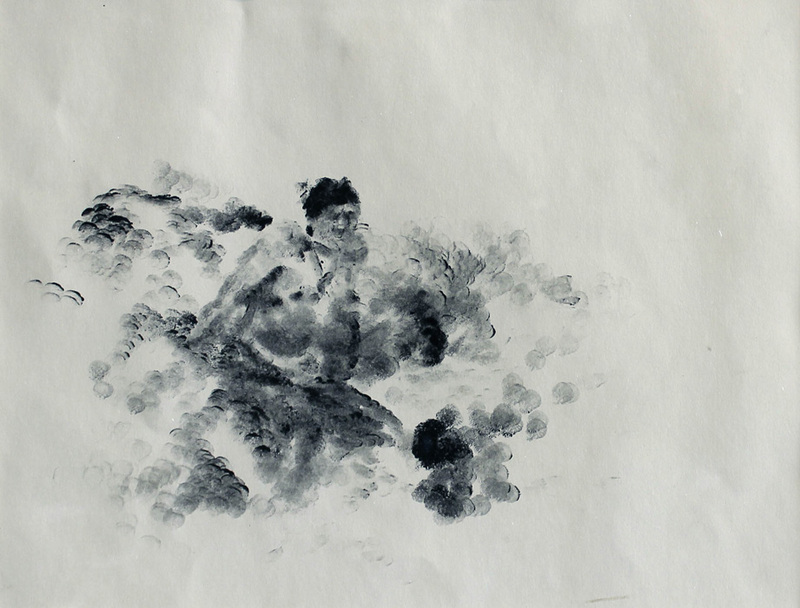 Daiana Oneto, “Earth Study,” watercolor on paper, 2015. 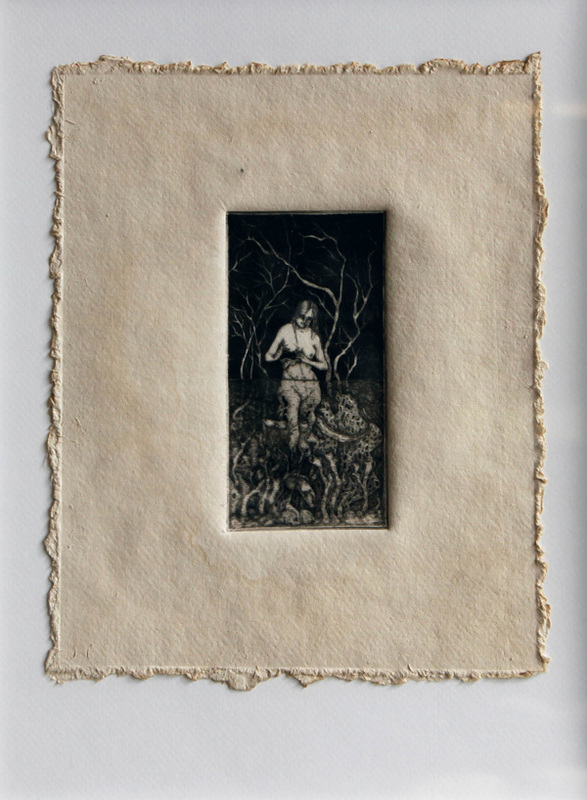 Beatriz Rodriguez, “The Rib that I Don’t Need,” photopolymer intaglio, 2016. 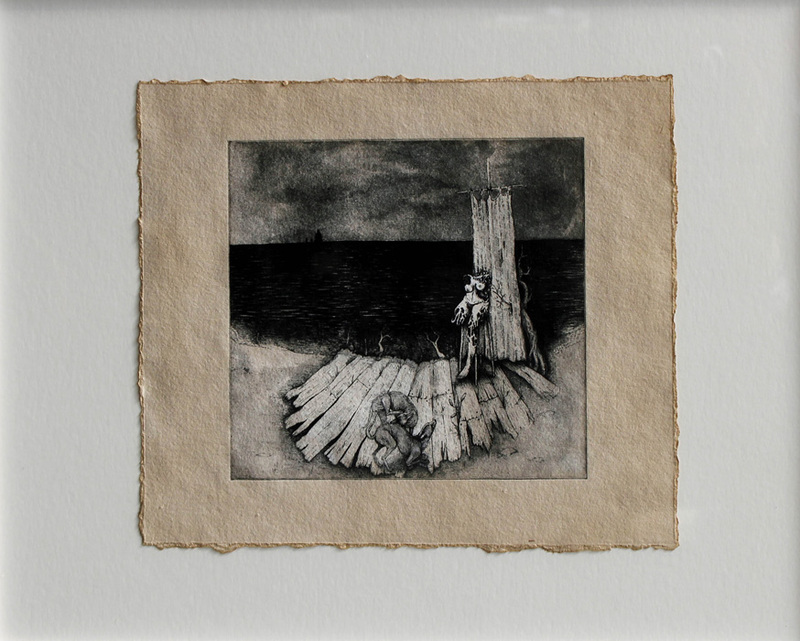 Beatriz Rodriguez, “Homesick,” dry-point on plexiglass, 2015. “Banal Magic: Latin American Artists Transmute the Ordinary” is first and foremost an exhibition about the environment. In an explicit homage to the Latin American literary style Magical Realism, curator Caroline Colby-Gonzalez has selected eight artists, four from Miami and four from Kansas City, whose work engages in fantasies and nightmares. And it’s little surprise that the artists of both flood-prone cities cast their imaginations towards the natural world and society’s relation to it. 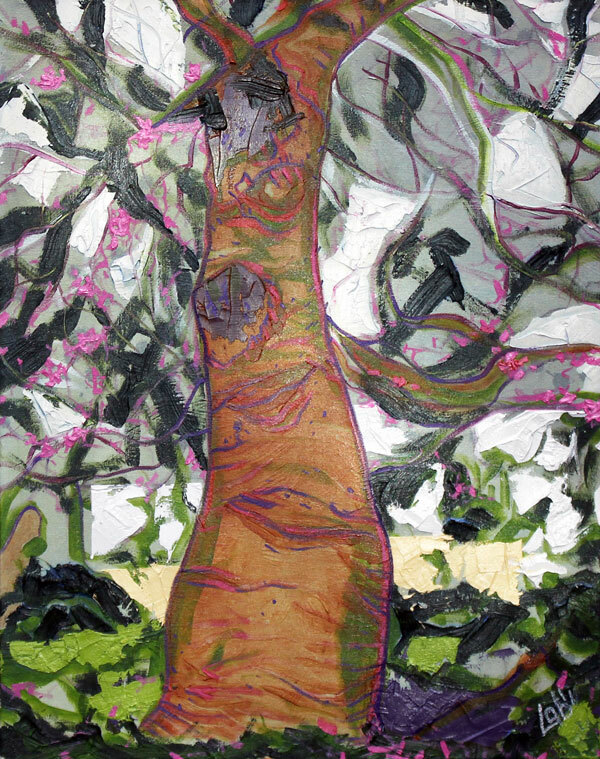 Miami artist Alvaro Labanino’s painting “Dancer from the Dance #2” epitomizes the exhibition’s title, “Banal Magic.” Labanino depicts a tree with pink flowers in a blurry pastel palette and expressionist style. Visible through the abstraction, are the scars of a cut limb and a short yellow retaining wall in the background. When seen in person on the street, the scene might appear as just another stunted and pruned tree and some poor landscaping, but when captured through the skill of Labanino’s eye and paintbrush, the ordinary becomes something magical. 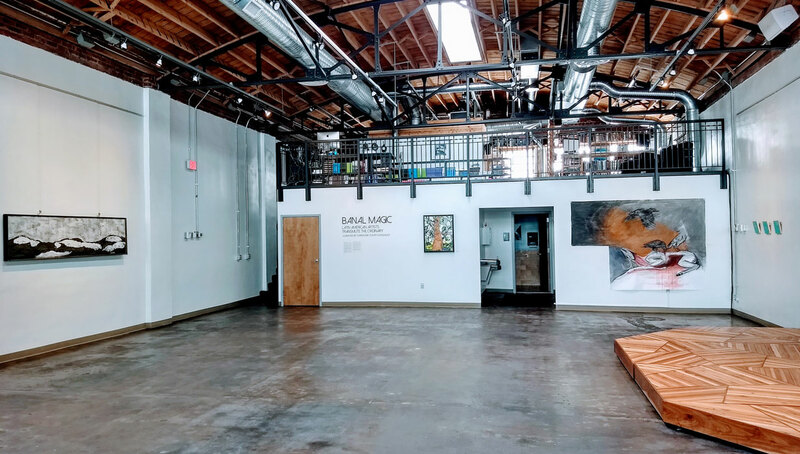 Thomas Luna, a KC painter, also tackles the environment in his series, “Manifest Decimation,” but he projects a much bleaker vision than Labanino. Made from plaster, joint compound, bone dust and ash, the thick, tar-like paintings are bleak dune landscapes rendered in black and white. A pun on Manifest Destiny, that divine ideology of American conquest of the continent, Manifest Decimation offers an apocalyptic counterpart, presenting a doomsday brought on by the industrialized destruction the nature. 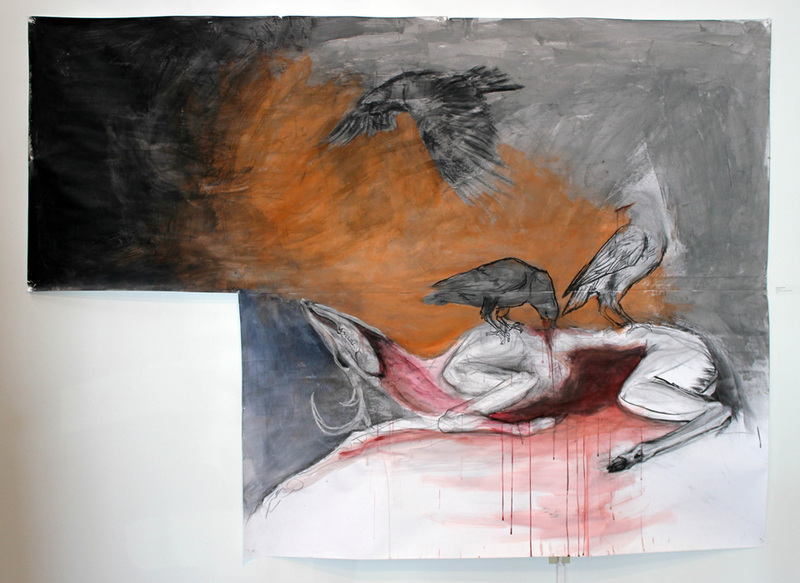 Miami artist Beatriz Rodriguez uses a very similar strategy. 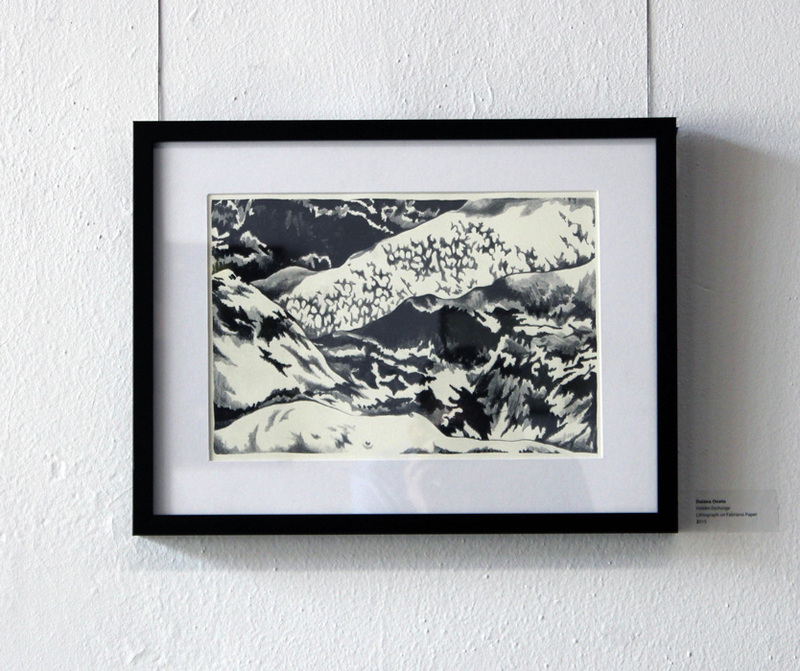 In skillful black and white prints she depicts people, animals, coral and shipwrecks in a fantastical world she calls Érebo, the Spanish word for Erebus, the ancient Greek god of darkness. These dark, dystopian scenes draw heavily on Rodriguez’ own experience migrating from Cuba to Miami. 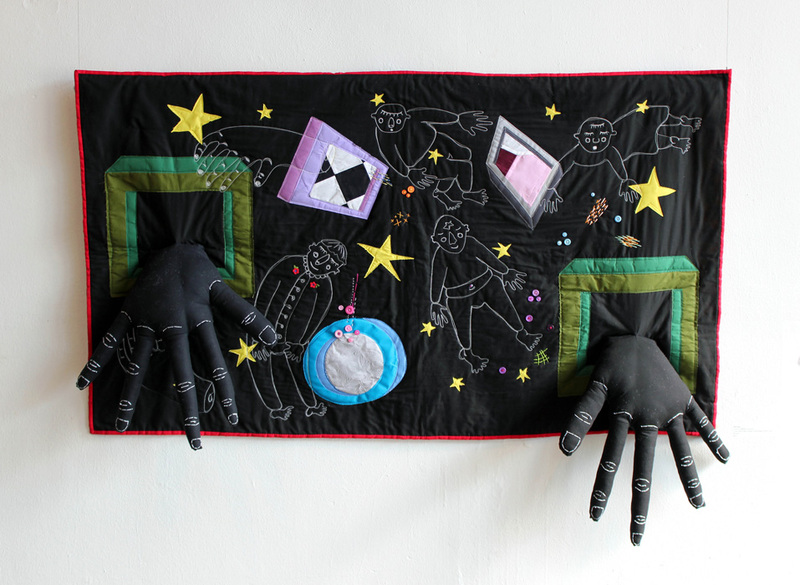 KC’s Ren Seitz’s quilt “I want to hold; I want to be held” similarly depicts a magical word that the artist calls ”Somewhere Not Here.” The black cotton quilt is embroidered with thread drawings of clown-like characters. Yellow stars and strange floating “picture frame portals” are quilted onto the surface. Two enormous, stuffed hands dangle off the quilt. Seitz imagines her comical and peaceful world as an idealized lost civilization where everyone is safe and no one is in danger. Miami artist Katty Aoun’s drawings at first appear to be lithographs or produced by some other mechanized print process, but the tiny lines that make up her drawings are actually carefully placed fingerprints. 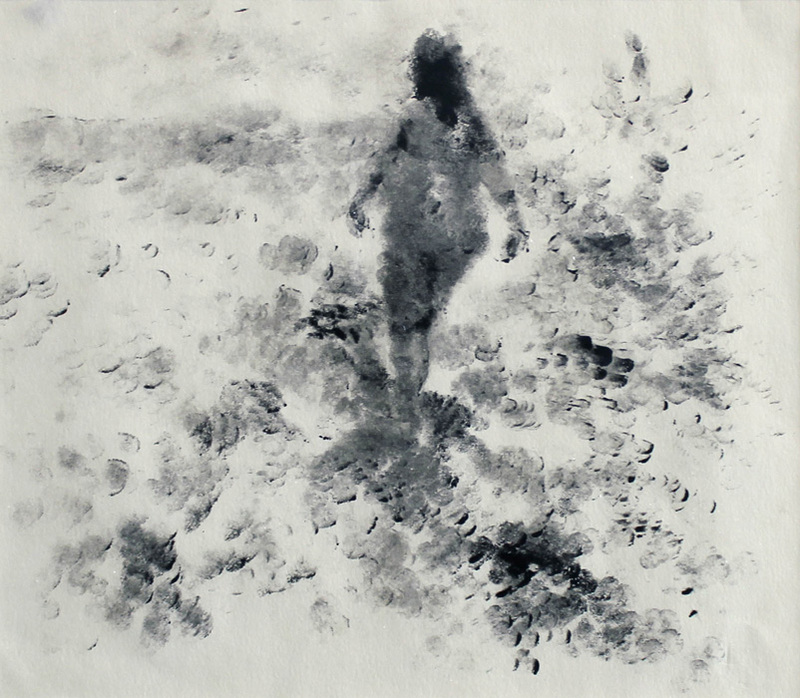 Employing a politically charged drawing technique that brings to mind geography, passports, police stations and border crossings, Aoun uses her fingerprints to lovingly create drawings of her family and friends, not as direct portraits, but ghostly abstract images of their bodies. 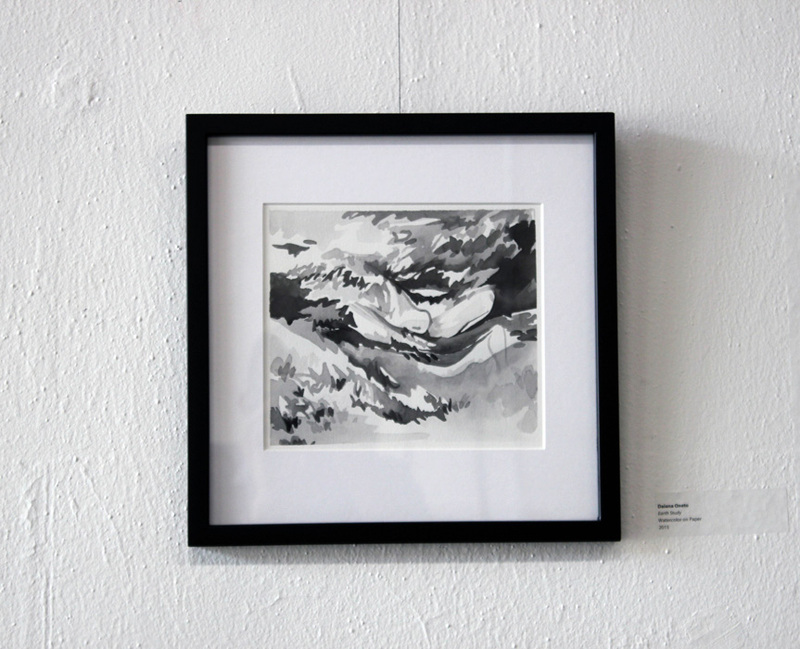 KC artist Daiana Oneto’s prints and watercolors use a similarly abstract and ghostly style to depict landscapes made from naked bodies. The curves of torsos and limbs blend into dark shadows, leaving always a partial body contorted in macabre positions. The stark, black and white images are both sensual and terrifying and serve as a metaphor for the disappeared of Argentina’s Dirty War, where thousands were killed by their government and secretly buried. That identity is a tricky thing in America is an understatement to be sure. In the exhibition catalogue for “Banal Magic,” curator Colby-Gonzalez writes “When I first came up with this show, I didn’t envision it as an exhibition making a grand statement on Latin American art or Latin American culture in general. 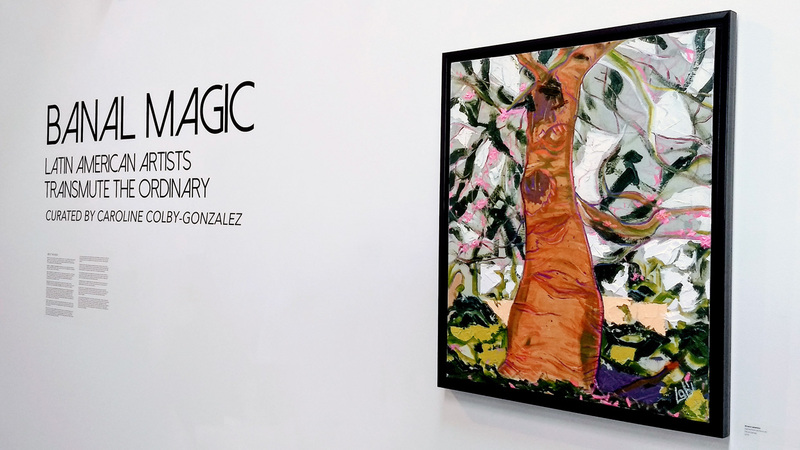 It began with my desire to provide a way to show works of art by artists who I fell in love with and who just so happened to be of Latin American descent.” And while that connection shouldn’t be ignored, what is more remarkable about “Banal Magic” is the wide range feelings about humanity’s relation to the natural world.